As EU leaders discussed migration at the European Parliament in Brussels on Thursday, migrants and refugees themselves gathered next door to discuss their challenges at a first refugee and migrant summit at EU level. 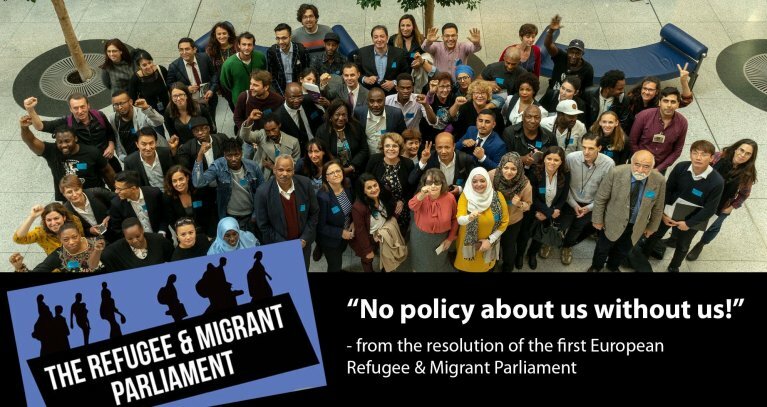 50 migrants and refugees from 16 EU states took part in the first parliamentary session of migrants in Brussels on Thursday. "We will stand up for our rights and we fear no one," Salah Zater, a 32-year old migrant from Libya said. The idea for the meeting organized by the Left parliamentary group was born one year ago when a group of migrants visited the EU Parliament. They suggested not talking about them but with them. "It's a historic day," said Cornelia Ernst, Member of Parliament of the Left party at the beginning of the meeting. "Your voices are important," she told participants. The meeting, she commented earlier, is aimed at "providing a forum for refugees and migrants to express their demands on a European level and to put their voices at the center of the political debate." The first panel discussion revolved around basic rights enshrined by law, as well as exploitation. Tracey Ayero, a migrant from Uganda living in the Netherlands, works for the LGBTI rights organization "Stitching Out & Proud". "We demand that more parties take problems of migrants and refugees seriously," she said. A Sudanese migrant living in southern Italy explained what he deems important for better integration. "There are migrants in Italy who have been living there 15 years who do not speak Italian," Ali Alasan said. "Humane conditions" for migrants would help migrants overcome the integration barrier. He called for language courses, work opportunities. Alasan himself founded a cooperative called "Sfruttazero", a tomato processing business that sells tomato sauce in cans. He wishes to "just be integrated in society somehow." Many migrants participating in the summit said travel restrictions are a big issue, the catholic news agency KNA reports. The migrants suggest that restrictions on free movement be eased and that migrants not be tied to a certain place or commune. "There are tremendous differences between EU countries in regard to refugees and migrants," Ali Ahmed Abitalib from Sudan pointed out. But all refugees share the same challenges of not having a home anymore, of having little resources, and of being in exile, he continued. "We want to work together for the common value of humanity." Parliamentarian Ernst hopes that the meeting will become a regular format within EU politics. She wants to win over other fractions of the EU Parliament for the idea of a refugee- and migrant Parliament. She envisions workshops, networking, resolutions. For Libyan migrant Salah Zater, the summit was a good start, and "a chance to inspire others." He himself lost two brothers in Libya who were killed in gunfire. "We have to be brave and tell people about our situation – here in our countries, in Europe."